Hortus Camdenensis | Dendranthema x grandiflorum Kitam. Very variable, frost-tender or half-hardy perennial with small to large flowers in a large range of form and colour. Up to 1.2m. [RHSE, Hortus]. Florist’s chrysanthemum: ‘Half a ball, double, symmetrical; centre well up and perfect; petals broad, blunt, and thick; colour decided, and every petal free from notch.’ [FC p.10/1848]. 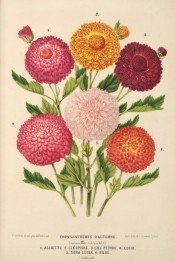 A figure in Illustration Horticole in 1870 shows how the chrysanthemum had improved in little over three decades. [IH pl.8/1870]. ‘We rejoice in the opportunity afforded us, of presenting our readers with the coloured engraving of a plant recently introduced to this country, which, as an ornamental one, promises to become an acquisition highly valuable. This magnificent species of Chrysanthemum, which we have hitherto seen only in the collection of Mr. Colville, Nurseryman, King’s-Road, Chelsea, began to flower with him early in November last, 1795; and as there were many buds on the plant, at that time, yet unopened, it appeared as if it would continue flowering during the early part of the winter at least. It is a plant of strong growth; the stem rising to the height of two or three feet, somewhat woody, much branched, beset with numerous leaves, having some resemblance to those of Mugwort, of a greyish hue; the flowers, on being smelt to, discover an agreeable fragrance, they are produced on the summits of the branches in a loose sort of cluster (those which terminate the main stem, grow to the size of a large carnation) of a dark purple colour; they are, it is to be observed, double, or rather between semi-double and double; the florets of the radius at first perfectly tubular or quilled, as they advance split gradually downward on the inside, their outside is of a greyish tint, which being visible in most of the florets, especially the younger ones, gives them a parti-coloured appearance; these florets do not so completely occupy the receptacle but that room is left for a few others in the centre, of a different form, and yellow colour, which, on examination, appear to have their parts perfect, as indeed do those of the radius ; the receptacle is beset with membranous paleae or chaffy scales, a circumstance which would lead us to confider this plant rather as an Anthemis than a Chrysanthemun, of which it has the calyx, with the foliage of Mugwort. New as this plant is to us, it appears to have been cultivated in China for ages: Linnaeus, who describes it in his Species Plantarum refers us to a figure in the Hortus Malabaricus; this figure, and the description accompanying it, agree generally with our plant, but the flowers are more double, much smaller, less clustered, and do not correspond in point of colour, yet there can be no doubt but our plant is a variety of the same; it is there described as growing in sandy situations, and having green petals. Rumphius, in his highly interesting work, the Herbarium Amboinense is much more minute in his information; he observes, that these plants were originally brought from China, where they flower in May and June ; that there are two sorts principally cultivated in India, the white and yellow-flowered, and a third sort, differing only in the colour of its flowers, which are red (the variety, as we suppose, here figured) began to be known among them at Amboyna; the flowers there do not expand well, owing to their being produced at the rainy seafon, and they decay without producing any seed. He tells us further, that it is cultivated chiefly for pleasure that the natives and the Dutch plant it only in the borders of their gardens, in which it does not succeed so well as in pots; and that, if it remains more than two years in the fame spot, it degenerates, becomes less woody, and often wholly perishes; that the Chinese, by whom it is held in high estimation, pay great attention to its culture ; they set it in pots and jars, and place it before the windows of their apartments, and that it is not unusual for them when they invite their friends to an entertainment to decorate their tables with it; on those occasions, he that produces the largest flower, is considered as conferring the greatest honour on his guests; besides these three varieties already mentioned, they have a fourth, which is more rase, whose flowers are of a greenish ash colour (is not this the var. figured in the Hort. Malab.?) all these varieties growing in separate pots, they place in certain quarters which they particularly with to decorate, and the effect they produce is highly pleasing: in the cultivation of this plant they spare no pains, the shorter it is and the larger its flowers, the more it is esteemed; to make it dwarfish, and at the fame time productive of flowers, they check its growth; for, if suffered to grow rude, it assumes a wild nature, and produces little but leaves; when it is coming into flower, of the three blossoms which usually terminate each branch, they pluck off two, and thus the remaining flower grows larger; by this, and other management, they cause the flowers to grow to the breadth of one's hand : he enumerates still a fifth sort with white flowers, which is extremely rare, and smaller than the others, called Tschuy say si, that is the drunken woman; its flowers morning and evening flag, and hang down as if debilitated by intoxication, in the middle of the day they become erect, and follow the course of the sun; but this (most probably a distinct species) is not exported from China. Finally, he remarks, that the Chinese and Malays are so attached to these flowers, that they even decorate their hair with them. Thunberg, in his Flora Japonica, enumerates it among the natives of that country, and describes it as growing spontaneously in Papenberg, near Nagasaki, and elsewhere, observing, that it is cultivated for the extreme beauty of its flowers in gardens and houses throughout the whole empire of Japan, and that the flowers vary infinitely in point of colour, size, and plenitude. Kaempfer’s account of it in his Amoen. Exot. is very similar. This Chrysanthemum appears to be a hardy greenhouse plant, and it is highly probable that, like the Camellia and Aucuba, it will bear the cold of our mild winters without injury. As it flowers so late, there is but little prospect of its producing seeds with us, but it may be increased by cuttings, and parting of the roots.’ [BM t.327/1796]. ‘The great variety and beauty of these flowers, when cultivated to the perfection of which they are capable, render them a superb acquisition to our gardens. Indeed, till we had seen the magnificent collection of all the varieties hitherto obtained, in the garden belonging to the Horticultural Society, we had formed no idea of the splendid exhibition such an assemblage afforded; and that too at a season when our gardens could otherwise boast of but little gaiety.’ [BM t.2556/1825]. The Botanical Register figures two varieties, a double yellow incurved and a double, quilled white. ‘A native of China; from whence the now so well-known purple variety was brought to France by M. Blancard a merchant of Marseilles in 1789. To France we are indebted for its introduction into this country, where, in 1795, it was considered new by the nurserymen and sold at a very high price.’ [BR f.4/1816]. This periodical lists all the varieties known in Britain by 1822: ‘In a former article (f. 455) the then imported varieties were enumerated, and were 12 in number; 10 more are now added, all of which have been procured from China by the Horticultural Society; 2 in 1819, the rest in 1820.’ [BR f.616/1823]. Ranunculus flowered - flowers similar to a double ranunculus. China aster flowered – often showing a disc, and then much resembling China asters. Marigold flowered – with well-formed double flowers, resembling double Cape marigolds in shape and size. Tassel flowered - being tall or very tall plants, with very large double, and more or less conspicuously drooping flowers, whose petals are usually elongated and quilled, and often greatly resemble the form of a tassel. Half-double tassel flowered – with only half-double flowers, and narrow elongated quilled petals; often drooping and somewhat resembling a tassel. Listed in the 1845, 1850 and 1857 catalogues [H.56/1845]. ‘Like many other long-cultivated plants the wild ancestor of the Chrysanthemum of the florists (C. sinense or C. morifolium) is not certainly known. Various botanists have suggested that the parent was C. sinense vestitum, or C. ornatum, or C. indicum, or C. makinoi. It seems probable that more than one species has had a part in originating it. Until prolonged experiments have been made in crossing the wild species of China and Japan the origin cannot be certainly known. As we know it today it is the result of cultivation, probably of the interbreeding of one or even several species, and certainly of selection through hundreds of years on the part of Chinese and Japanese gardeners.’ [RHSD]. Most Chrysanthemum species are now attributed to Dendranthema.